1 deck. Difficult. Unlimited redeals. 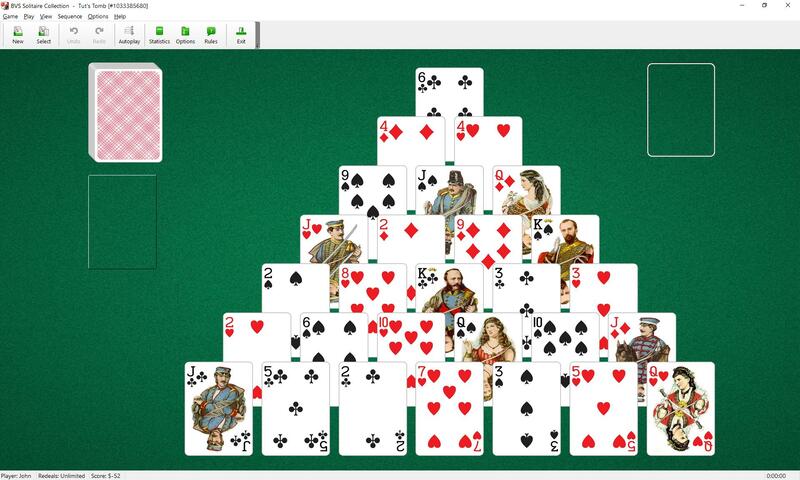 This solitaire uses one deck (52 cards). 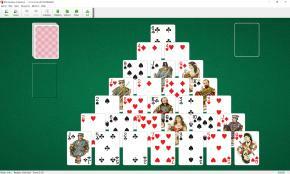 A pyramid of cards is dealt, consisting of 28 cards in 7 overlapping rows. To pair up all the cards in the pyramid in pairs of cards that total 13 and remove them to the single discard pile. Select pairs of cards that total 13 using the mouse (for example: 7 and 6, 3 and 10, 2 and Jack, Queen and Ace). Only uncovered cards in the pyramid and the top card of the waste pile are available for play. There is one exception to this rule. If a card is covered by only one card and the two cards together make up 13, they can also be discarded. Kings are discarded as a single card rather than as a pair. To discards Kings, simply click on them. Aces are worth 1. Jacks are worth 11. Queens are worth 12. Kings are worth 13. When you have made all the moves initially available, begin turning over cards from the stock pile. 3 cards at a time are turned over from the stock. The stock pile can be turned over as many times as you wish.